This year for Christmas, my parents gave me a mini popover pan, knowing that I love popovers but have not had prior success in making them myself.Â In an attempt to get it right this time around, I called my grandmother, Sharpie in hand, and wrote her recipe on the outside of the pan’s packaging as she recited the ingredients and methods. The popovers were a success! They were crispy on the outside, while soft and eggy with lots of air pockets on the inside.Â While there were probably several variables involved in my lack of success in previous attempts, I think the key step I was missing was to heat the popover pan empty in the oven for a few minutes before pouring the batter into it. When the oven has reached 450 degrees, heat the empty popover pan for a few minutes, then remove and fill each of the baking cups to about 2/3 full, being careful to divide the batter among all of the baking cups.Â Bake at 450 for 20 minutes, then reduce heat to 350 for up to 15 minutes, watching carefully so that they do not burn. This entry was posted in Bread and tagged recipe. Bookmark the permalink. I can say from experience that they were delicious! With all the love I have, I’m telling you those are not successful. I’ve unofficially declared 2014 “the year of the popover” in our house. I have plenty of pictures with progress & evolution of popovers. And if they have that moistness in the middle, they didn’t turn out right. A popover should be completely hollow in the middle. One of the key important steps is having plenty of pre-heated fat (butter) in the bottom. And although ‘Pam’ or cooking oil will help to prevent sticking, there will just never be enough heated mass to cause the center to extract into a perfect popover. It isn’t easy telling someone that things aren’t right. But I care enough about the passion of popovers to make sure you’ve at least had a perfect popover. Hopefully you appreciate the ‘tough-love’ and I’d be more than glad to show you any time, Skype or any other way I possibly could what I have discovered. I’ve made no less than 200 popovers this year. Mom had a stroke a few years back & recently learned this was one of her favorite childhood memories. I purposed to discover how to make one just right & we know when they come out right, and when they don’t. 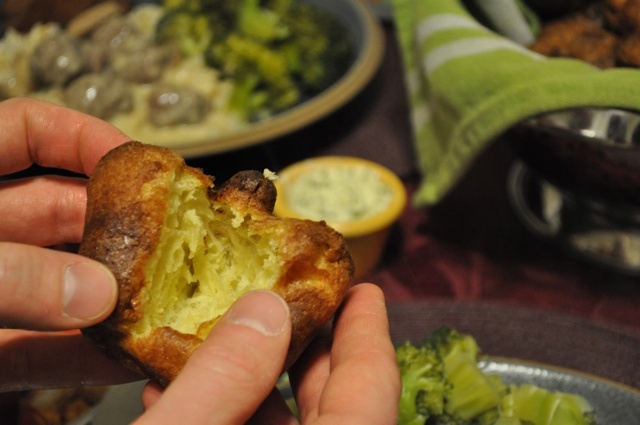 The picture here with the popover splitting & the solid ‘airy’ part in the middle is clearly an example of popovers gone wrong. If you e-mail, and ask, I’ll be happy to share my insights.